At Seven Hills Veterinary Hospital, blood tests for cats can be processed and analyzed on premises at our in-house laboratory. Having an on-site laboratory allows us to quickly and reliably determine and diagnose a health concern, and then implement a successful medical intervention based on the results. Once we establish a correlation, we can order any subsequent feline blood work procedures necessary to arresting and treating the condition. In this way, feline blood tests serve as very valuable tools in a veterinarian’s toolkit for helping to detect, identify, diagnose and ultimately treat illness or disease. Albumin (ALB): This is a serum protein that helps evaluate hydration, hemorrhage and intestinal, liver and kidney disease. Alkaline phosphatase (ALKP): Elevations in this test may indicate liver damage, Cushing’s disease or active bone growth in a young cat. This test is especially significant in cats. Alanine aminotansferase (ALT): This test may determine active liver damage, but does not indicate the cause. Amylase (AMYL): Elevations in this test indicate pancreatitis or kidney disease. Aspartate aminotransferase (AST): Increases in this test may indicate liver, heart or skeletal muscle damage. Blood urea nitrogen (BUN): This test determines kidney function. An increased level is called azotemia and can be caused by kidney, liver and heart disease as well as urethral obstruction, shock or dehydration. Calcium (Ca): Changes in the normal level of this test can indicate a variety of diseases. Tumors, hyperparathyroidism, kidney disease, and low albumin are just a few of the conditions that alter serum calcium. Cholesterol (CHOL): This test is used to supplement diagnosis of hypothyroidism, liver disease, Cushing’s disease and diabetes mellitus. Chloride (Cl): Chloride is an electrolyte that is typically lost with symptoms like vomiting or illnesses such as Addison’s disease. Elevations often indicate dehydration. Coristol (CORT): Cortisol is a hormone that is measured in tests for Cushing’s disease (the low-dose dexamethasone suppression test) and Addison’s disease (ACTH stimulation test). Creatinine (CREA): This test reveals kidney function and helps distinguish between kidney and non-kidney causes of elevated BUN. Gamma Glutamy transferase (GGT): This is an enzyme that indicates liver disease or corticosteroid excess. Globulin (GLOB): This is a blood protein that often increases with chronic inflammation and certain disease states. Glucose (GLU): Glucose is a blood sugar. Elevated levels may indicate diabetes mellitus. Low levels can cause collapse, seizures or coma. Potassium (K): This is an electrolyte typically lost with symptoms such as vomiting, diarrhea or excessive urination. Increased levels may indicate kidney failure, Addison’s disease, dehydration or urethral obstruction. High levels can lead to cardiac arrest. Lipase (LIP): Lipase is an enzyme that may indicate pancreatitis. Sodium (Na): Sodium is an electrolyte often lost with signs vomiting, diarrhea, kidney disease and Addison’s disease. This test helps indicate hydration status. Phosphorus (PHOS): Elevations in this test are often associated with kidney disease, hyperthyroidism and bleeding disorders. Total bilirubin (TBIL): Elevations in this test may indicate liver or hemolytic disease. This test helps identify bile duct problems and certain types of anemia. Total protein: This test indicates hydration status and provides additional information about the liver, kidneys and infectious diseases. Thyroxine (T4): Thyroxine is a thyroid hormone. High levels indicate hyperthyroidism in cats. Cat bloodwork is an essential component in the diagnosis of disease. Just like any diagnostic tool, blood tests for cats are more effective when used as part of a diagnostic plan which may include other tests. For example, elevated BUN and creatinine levels can indicate a kidney problem. However, they can also indicate mild dehydration in the period leading up to the bloodwork. This is why ordering additional testing is necessary to obtain an accurate diagnosis. 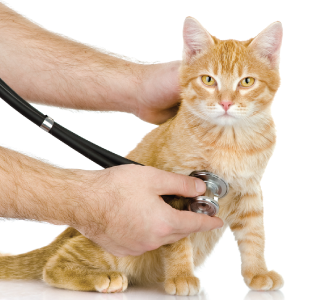 If your cat is exhibiting any abnormal behavior, please schedule a veterinary appointment today!